Heyyy, here we are... our first "seat change" in the line-up. Blackhawk's on break, and in his place... someone with the same first name, Black Canary! I'm using the Birds of Prey-era logo in the banner... I like the way it looks there. This here's a bit of an iconic cover... if any of Action Comics Weekly's covers can be considered "iconic". It's a Brian Bolland piece, in which, Dinah burns her JLI-era "Jazzercise" uniform. A decision I'm sure was mostly popular at the time. It's only more recently that I see any sorta clap-back on that, and I'm sure there are folks who actually prefer the "80's getup"... but I think some of that has to do with the fact that, in the social media age we're all climbing over each other to prove to be "the one" with the "unpopular opinion". Then... the "unpopular" opinion becomes the popular opinion... but we keep calling it the "unpopular" opinion anyway. Ehh, whattayagonnado? For me... I'm down with the classic look, so jot my name on the side of the "popular" opinion. We open in a California orange grove, where a pair of workers are... well, working... and sweating. They talk about the job opportunities afforded to them in the United States... and how the rest of their families still live in Mexico... and the danger of being "sent back". I guess we're going topical. Oh yes, we certainly are... our next scene is in the Headquarters of Immigration and Naturalization in Lincoln, Nebraska. 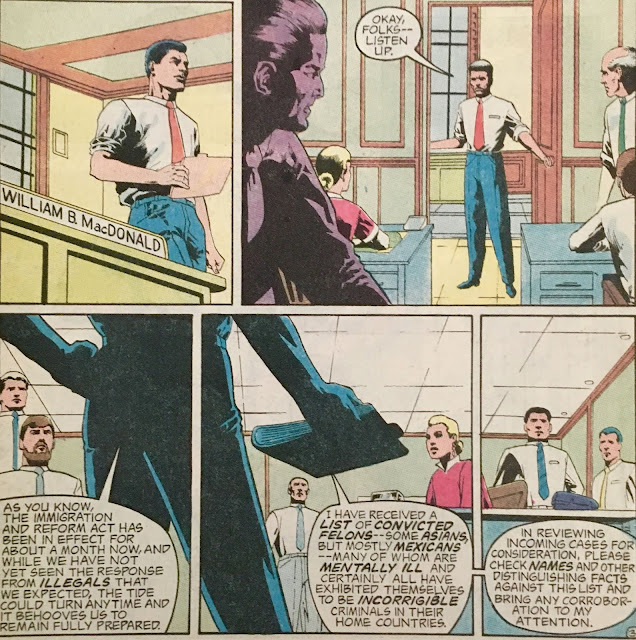 A William B. MacDonald is addressing his staff... with some, likely biased reports of mentally ill and dangerous "illegals" needing to be rounded up. I'm guessing subtlety will not be a hallmark of this story. We next travel to Seattle, where a young man is being chased by.. several other young men. 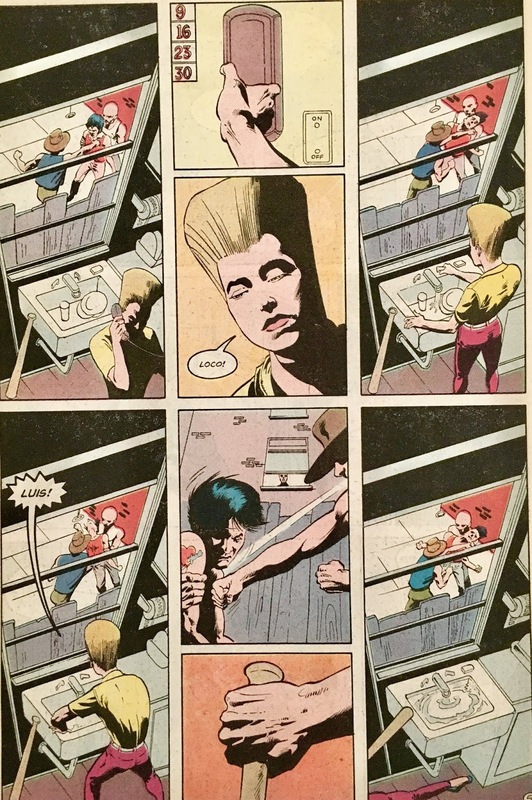 They catch up to him in an alley that can be seen via the kitchen window of a woman with a rather impressive Kid N Play hairdo. She recognizes the boy getting beaten as "Luis", and rushes out to his aid... baseball bat in tow. Next, we shift to Sherwood Florist... where Dinah is, you guessed it, burning her Jazzercise uniform! Ollie remarks that it smells like "hot plastic". Dinah doesn't really give a reason for burning it... but I'm sure it resulted in a few reader fist-pumps nonetheless. As this goes down, there is a news report on the television, that I'm going to assume will become more important as we move along. Dinah and Ollie head into the kitchen for some tea... at which time, Dinah reveals that she invited a woman named Rita over. 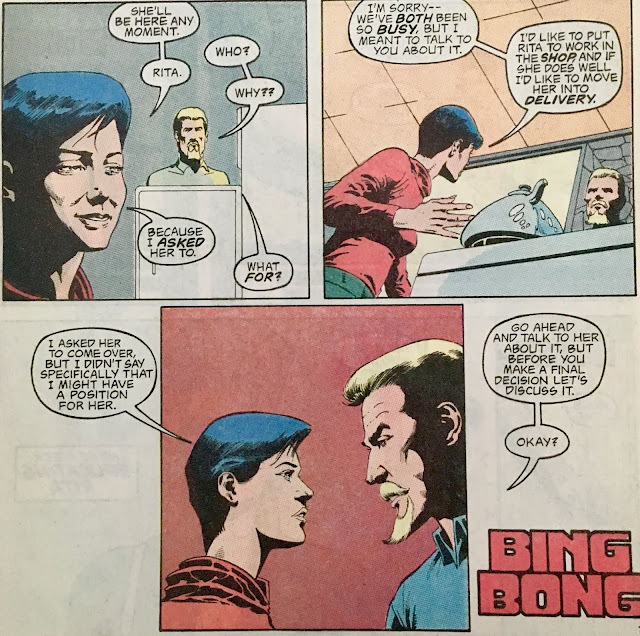 She is a recovering drug-addict (though Dinah refers to her as "chemically dependent") who once dove through the front window of Sherwood Florist. Anyhoo, now that she's clean (or "chemically independent", if you rather) Dinah wants to offer her a job. Ollie ain't too sure... and honestly, neither am I. Then... the doorbell rings. 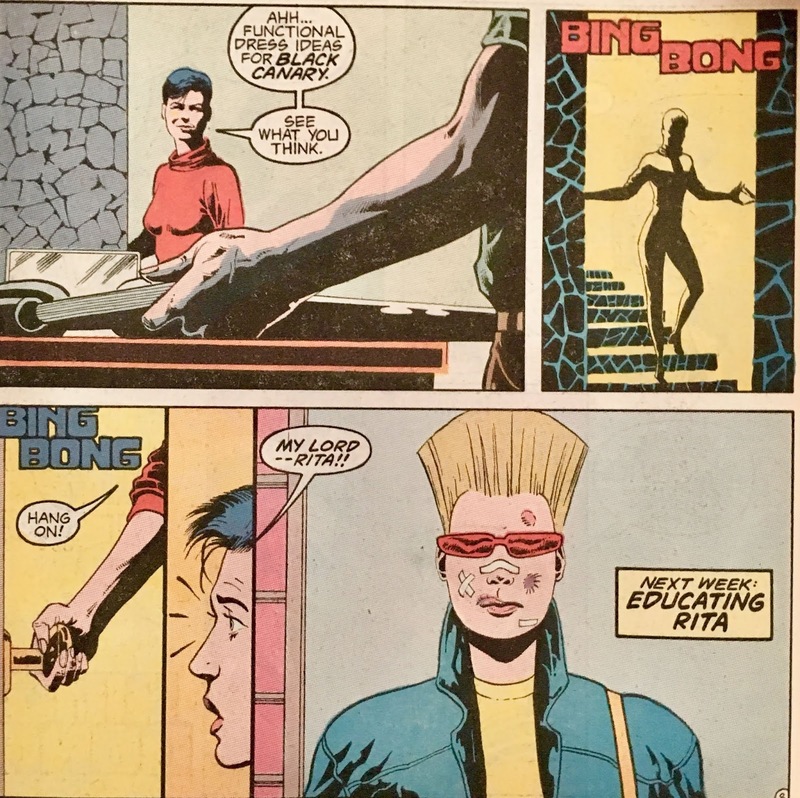 It's Rita... who is that same woman with the impressive Kid N Play hairdo (or maybe she's a Bull Nakano fan?)... and she's in quite a state! I'll say this much. 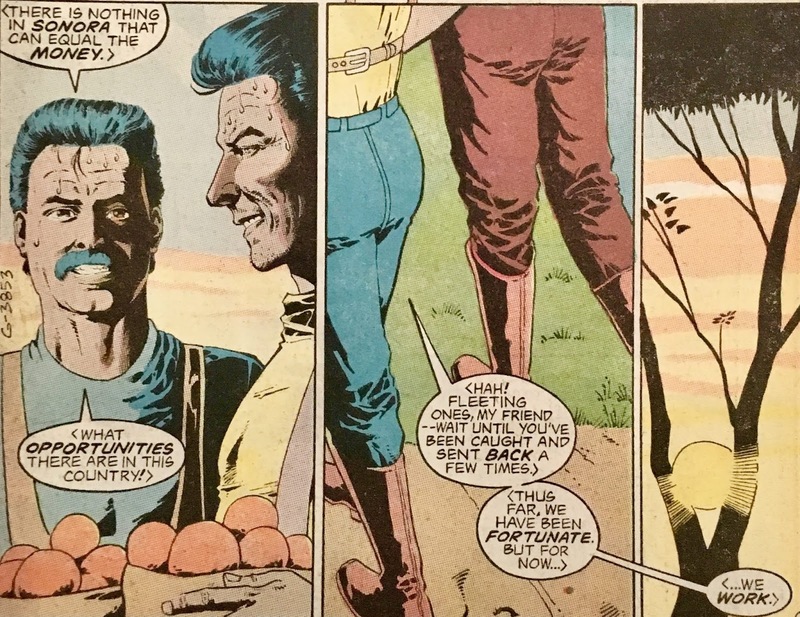 I really miss Blackhawk. There's really not enough here to pass judgment... but what we do get is awfully heavy-handed and unsubtle. I have a feeling that this arc will be kind of a bummer... and more interested in making a statement than telling a story. This is just my "hot take"... I haven't read any further, so I could be (and hopefully am) completely wrong. What did I like? Well, Ollie interjected a bit of levity... that much was fun. The burning of the costume... ehh.. a bit over-dramatic perhaps, especially from someone who, not two panels later, refers to herself as a "hopeless nostalgic". I mean, nostalgic folks don't normally burn their possessions, do they? I consider myself nostalgic... to the point of being a packrat. Oh well. The Immigration bit. I'll withhold judgment for now... I don't know how Wright will handle this. I have my suspicions... but, I'll keep 'em to myself. I will say that ol' Mr. MacDonald may as well have had horns and a forked-tail. Just cartoonish... which, goes back to our "unsubtle" situation. Overall... well, I'm not sure. The art is good, though it will take a bit getting used to. We haven't had any Dinah-in-the-suit yet, so... what say, we just treat this as "prologue"? Note: We won't be getting the next chapter for twelve days... as it will become the Action Comics Weekly "Anchor" story for the rest of its duration as part of the line-up. Mr. Jordan will reclaim his spot as "lead feature" next week. 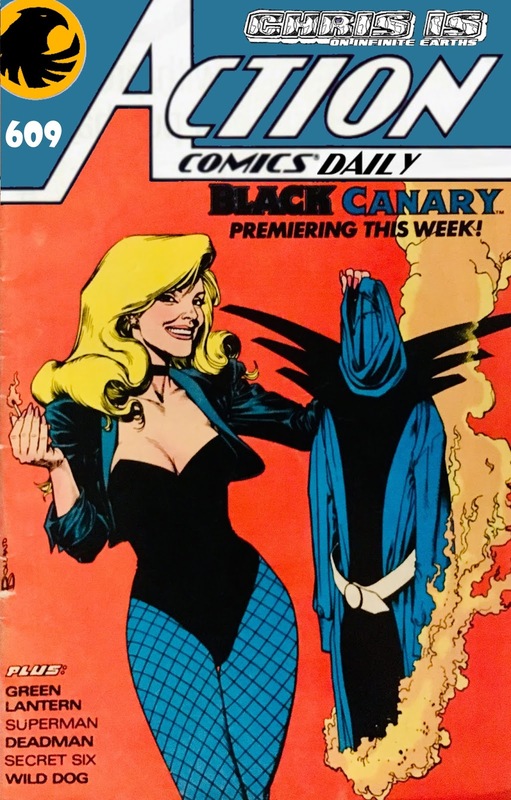 Tomorrow: "There you go again..."
If memory serves me correctly, this Black Canary story would have come out right after the Green Arrow: The Longbow Hunters mini series. 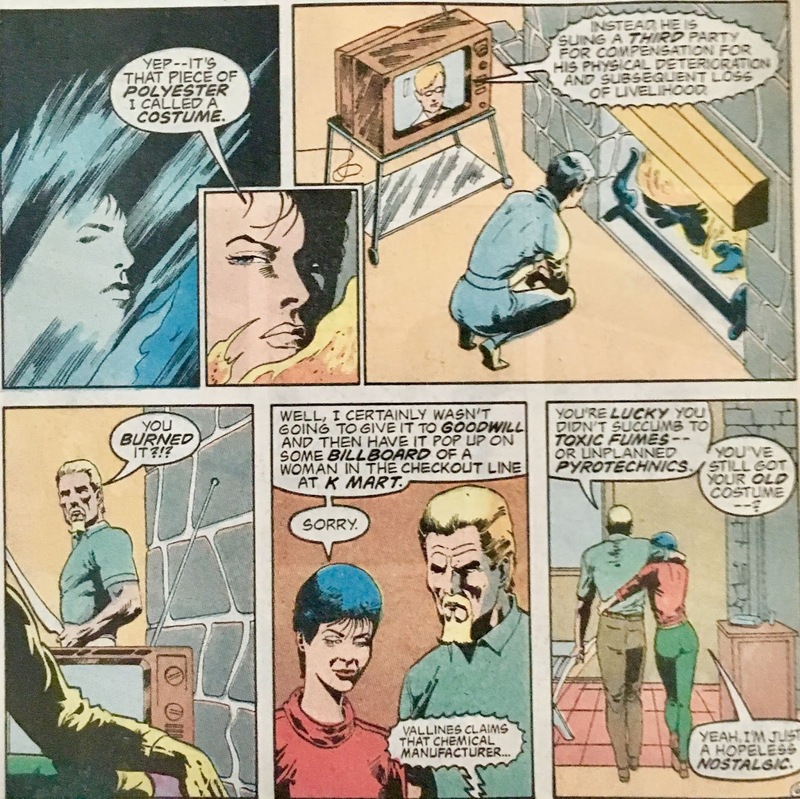 In Longbow Hunters Dinah is captured and tortured and as a result looses her Canary Cry superpower. Mike Grell had her pulled from appearing in Justice League International, where she was wearing that costume that she burns, so he could have exclusive use of her in the new Green arrow monthly. Her burning the costume is representing her giving up the big time JLA super-hero life, and becoming a more realistic character. That is true! I'm going to be discussing that bit of trivia during our week-ending "compilation" piece this coming Thursday!